Our attention to every detail in the world of Civil Engineering & Demolition contracts, puts us at the forefront of our industry. AR Demolition work in Nottingham, Nottinghamshire and surrounding areas. Client satisfaction is our number one priority and we consistently achieve this thanks to our highly skilled personnel and total commitment to our clients. 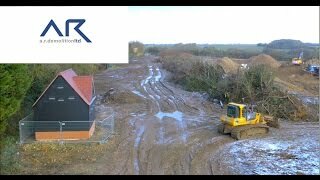 Here at AR Demolition, every aspect of the demolition process is undertaken, including land reclamation and recycling and asbestos removal. Our health and safety demolition contractors will ensure that these are carried out in the safest possible manner. With our team of highly professional Civil Engineers, we will deal with not only the design and construction of your project but also the maintenance within the Nottinghamshire area and beyond. It is imperative to us that we adhere to our client’s vision and budget when it comes to projects such as cut/fill exercises, piling mat installation, reduced level digs and bulk excavation. We guarantee that we will always provide our clients with the best service possible by utilising the skills of our highly trained workforce. Our investment in new plant and the latest tools is second to none and our ‘hands on’ approach to commercial partnering is just part of the reason we continue to achieve awards for our work.